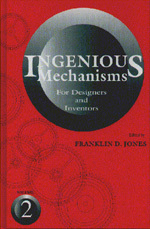 Each of the four volumes of Ingenious Mechanisms is an independent treatise on the subject of mechanisms. The books are similar in size and general character, but the contents are different. The mechanisms described are grouped into chapters according to general types. Together with the complete index, this arrangement by function makes it easy to find the class of movement desired, and enables you to compare mechanisms which are similar in purpose but different in design. The descriptions and illustrations are confined to the important and fundamental elements, so that time is not wasted reading a lot of useless or irrelevant detail. Readers are told plainly and briefly what each mechanism consists of, how it operates, and the features which make it of special interest. The particular mechanisms have been selected because they have stood the test of actual practice. Among the mechanisms described and illustrated by working diagrams are: cam applications and special cam designs; intermittent motions from gears and cams; interlocking devices; valve diagrams; reversing mechanisms of special design; tripping or stop mechanisms; drives of crank type for reciprocating driven members; feeding mechanisms and auxiliary devices; feeding and ejecting mechanisms; and many, many more. Cams and Their Applications. Intermittent Motions from Ratchet Gearing. Intermittent Motions from Gears and Cams. Tripping or Stop Mechanisms. Electrical Tripping Mechanisms. Reversing Mechanisms for Rotating Parts. Overload Relief Mechanisms and Automatic Safeguards. Interlocking Devices. Driving Mechanisms for Reciprocating Parts. Quick-Return Motions for Tool Slides. Speed-Changing Mechanisms. Differential Motions. Straight-Line Motions. Miscellaneous Mechanical Movements. Hydraulic Transmissions for Machine Tools. Automatic Feeding Mechanisms. Design of Automatic Feeding Mechanisms. Hopper Design for Automatic Feeding Machinery. Magazine Feeding Attachments for Machine Tools. Design of Magazine Carriers and Slides. Cam Applications and Special Cam Designs. Intermittent Motions from Gears and Cams. Intermittent Motions from Ratchet Gearing. Intermittent Motions of the Geneva Type. Tripping or Stop Mechanisms. Overload Relief Mechanisms and Automatic Safeguards. Reversing Mechanisms of Special Design. Drives of the Crank Type for Reciprocating Driven Members. Reciprocating Motions Derived from Cams, Gears, Levers and Special Mechanisms. Speed-Changing Mechanisms. Special Transmissions and Over-running Clutches. Self-Centering Pivoted Levers and Sliding Members. Multiple-Lever Mechanisms with Dwelling or Idle Periods and Other Special Lever Combinations. Feeding Mechanisms and Auxiliary Devices. Feeding and Ejecting Mechanisms for Power Presses. Miscellaneous Mechanisms or Mechanical Movements. Engine Valve Diagrams and Their Applications in Studying Valve Action. Cam Applications and Special Cam Designs. Intermittent Motions from Gears and Cams. Intermittent Motions from Ratchet and Geneva Mechanisms. Overload, Tripping, and Stop Mechanisms. Locking, Clamping, and Locating Devices. Reversing Mechanisms of Special Design. Reciprocating Motions Derived from Cams, Gears, and Levers. Crank Actuated Reciprocating Mechanisms. Variable Stroke Reciprocating Mechanisms. Mechanisms Which Provide Oscillating Motion. Mechanisms Providing Combined Rotary and Linear Motions. Speed Changing Mechanisms. Speed Regulating Mechanisms. Feed Regulating, Shifting, and Stopping Mechanisms. Automatic Work Feeding and Transfer Mechanisms. Feeding and Ejecting Mechanisms for Power Presses. Hoppers and Hopper Selector Mechanisms for Automatic Machines. Varying Continuously Rotating Output. Clutch and Disconnecting Devices. Miscellaneous Mechanisms. Index.